The effects humankind is having on the environment have long been discussed and debated. However recently, it seems that conversations have shifted towards a more urgent and meaningful discourse. The planet is massively suffering from the impact of burning fossil fuels, deforestation, plastic pollution, and much, much more, all of which are caused by the human race. Yet all is not lost. The countdown is on for humans to save the Earth, and thankfully there is a number of things which can be done to make sure our homes remain as environmentally friendly as possible. The damage that plastic waste has on the planet’s ocean wildlife is something which has been thrust into the limelight in recent years. Shocking images reveal just how polluted these once serene looking parts of the world have become. Some may think that simply doing things like purchasing loose vegetables or a shampoo bar will do little for the overall impact – but society has to start somewhere, and collectively, this type of action will help tremendously. Most people are guilty of wasting water – leaving the tap on when brushing teeth, a shower that runs a few minutes more than necessary – so now is as good a time as any to start getting serious with how much water is used in the home. Furthermore, it is time to start thinking about where that water is coming from, and whether or not it can be more environmentally and also cost-effective. Find a trusty guide to boreholes that will teach readers all they need to know about aquifers and how they can be accessed for use in the home. While many may not have heard of a sustainability consultant, they are indeed around and can offer invaluable, effective advice on how to make a home more ecologically friendly. They analyse a home, determine how ‘green’ it is, and then offer suggestions on what can be done to improve this ‘green’ reading. This is something to consider if you are serious about making changes. 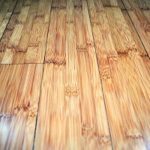 When it is time to get new flooring consider bamboo. Bamboo is one of the fastest growing plants on earth, meaning it could effectively replace the need to use slow growing timber trees for hardwood flooring. It also still remains stylish and very versatile to work with. Once those floors are sorted, consider furnishing them with rugs in the colder months too. Using rugs on wooden floors can save 4%-6% on energy bills, meaning homeowners are saving money as well as saving the planet. A simple yet very effective way to reduce a home’s carbon footprint – fridges are huge consumers of electricity after all. Placing a fridge somewhere where the sunlight often hits forces the appliance to work harder, thus using more energy. Moving it to the shade will help solve this problem – just make sure it’s placed at least 7.6cm away from the wall, as this is the distance advised to maximise airflow.